Cocooned inside a heat shield, the robotic lander weathered extreme temperatures reaching 2,700 degrees Fahrenheit (1,500 degrees Celsius) as it entered the Martian atmosphere, unfurled a supersonic parachute, then pulsed 12 retrorockets up to 10 times every second in the final phase of the descent toward the red planet, finally settling on the surface with three landing legs. Controllers confirmed InSight’s landing at 2:54 p.m. EST (11:54 a.m. PST; 1954 GMT), roughly eight minutes after the touchdown actually occurred at Elysium Planitia, a broad equatorial plain selected for its relatively flat surface free of large boulders and craters. It took that long for radio signals from InSight to travel from Mars to Earth, a distance of 91 million miles (146 million kilometers). 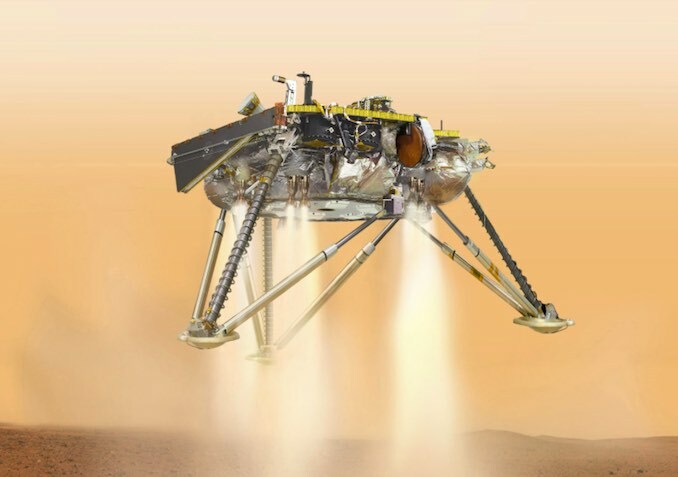 Tense engineers monitored the $993 million mission’s white-knuckle arrival at Mars from a control center at NASA’s Jet Propulsion Laboratory in Pasadena, California, receiving data from the lander via a pair of briefcase-sized CubeSats sent to the red planet with InSight. The twin Mars Cube One, or MarCO, microprobes were the first spacecraft of their size to fly to another planet, and the CubeSats were primarily developed as a technology demonstration to pave the way for future interplanetary smallsats. But the CubeSats carried a radio to relay data from InSight back to Earth. The innovative miniature radio, the size of a softball, converted UHF signals from InSight to an X-band frequency to transmit to the ground. Engineers were not sure the MarCO CubeSats would work, so InSight’s planners had two other ways to get data from the landing — one in real-time using a weak carrier signal received by huge ground-based dish antennas, and another data relay route through the Mars Reconnaissance Orbiter, a NASA satellite flying around the red planet that recorded telemetry from the lander for later playback to Earth. But the MarCO CubeSat came through Monday, giving officials detailed information about InSight’s status as it maneuvered through the Martian atmosphere. Rob Manning, JPL’s chief engineer, provided color commentary on NASA TV’s broadcast of InSight’s landing. “We have radar activation where radar is beginning to search for the ground,” Szalai said as InSight remained suspended under a 39-foot (11.8-meter) diameter parachute. “Once the radar locks on the ground and InSight is about one kilometer above the surface the lander will separate from the backshell and begin terminal descent using its 12 descent engines. Monday’s landing concluded a 301-million-mile (484-million-kilometer) journey for InSight that began May 5 with a predawn fog-enshrouded blastoff aboard a United Launch Alliance Atlas 5 rocket from Vandenberg Air Force Base in California. 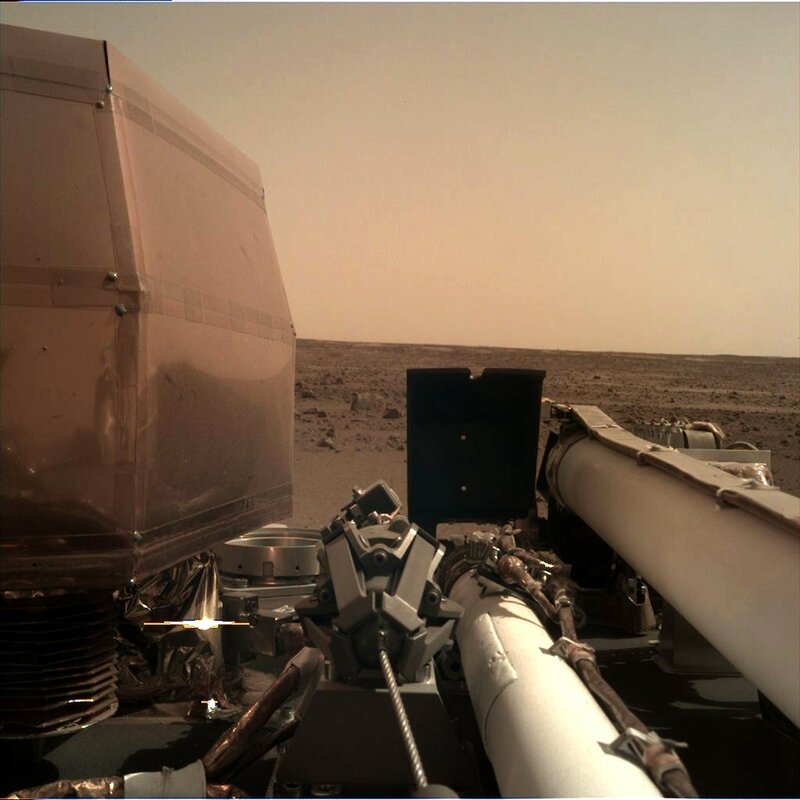 InSight was the first Mars mission to leave Earth from the West Coast, supplanting Cape Canaveral, the typical departure point for interplanetary probes. Within a few minutes of landing, InSight radioed its first image from Elysium Planitia, showing a flat, mostly featureless landing site, with sandy soils and a modestly-sized rocket near one of the lander’s footpads. Protective lens covers on both of the probe’s cameras will be released late this week, allowing InSight to gain a clearer view of its environment. InSight’s arrival on the red planet Monday was the first successful Mars landing in six years. The stationary robot joins NASA’s Curiosity rover already on Mars, exploring Gale Crater roughly 340 miles (550 kilometers) from InSight’s landing zone. NASA officials were elated with the landing in a press briefing Monday afternoon. More than half of all Mars landing attempts have ended in failure. At first glance, InSight’s surroundings appear to match predictions based on imagery from orbiting satellites. Mission managers wanted to send InSight to Elysium Planitia because it was a safe landing site, and offered smooth terrain for the lander’s robotic arm to place a pair of European-built science instruments on the surface. “There certainly are some small rocks, but those look pretty manageable,” Hoffman told reporters after Monday’s landing. Bruce Banerdt, InSight principal investigator at JPL, said the lander arrived on flat terrain, with a tilt of just 2 degrees. Monday’s landing is just the beginning of a months-long process to survey InSight’s landing site and deploy the mission’s two science payloads. “We were all certain that that first image would help us determine how difficult of a job we would have in placing the instruments, and I’m very happy that it looks like we’ll be able to do it quite easily, we hope,” said Elizabeth Barrett, InSight instrument operations lead at JPL. A fresh data downlink from InSight through the Mars Odyssey orbiter Monday night confirmed the solar arrays on the lander opened and were collecting sunlight, a crucial step in ensuring the craft’s long-term survival. Post-landing checkouts of InSight’s robotic arm and instruments are planned starting Tuesday. InSight’s nearly 8-foot-long (2.4-meter) robotic arm will place a French-built seismometer and German-made heat probe on the Martian surface next to the lander in the next few months. The contributions from CNES — the French space agency — and the German Aerospace Center — or DLR — totaled around $180 million. NASA’s expenditures on the InSight mission come to $813 million, including a $163 million launch contract with United Launch Alliance. The InSight mission’s robotic arm was originally built for the canceled Mars Surveyor lander that was supposed to launch in 2001. Other leftover parts on InSight include a landing radar originally built as a spare for the Phoenix mission, and surplus structural booms from the Curiosity rover repurposed for a Spanish-built weather station on InSight to collect temperature and wind data. InSight will first put the seismometer package on the surface near the lander, then the arm will retrieve a wind and thermal shield to cover the instrument. The heat probe will be deployed last for its mechanized mole to start digging into the Martian crust. Both instruments will transmit data through electric tethers leading to the lander. “Sensitive is really an understatement,” Banerdt said of the seismometer. “It’s an exquisitely sensitive device for measuring the motion of the ground. And when we talk about motion, we’re talking about vibrations that have an amplitude comparable to the size of an atom. “These are waves that were generated, maybe, by a marsquake on the other side of the planet, have traveled all the way through the planet, getting their waveform modified as they go through the planet and picking up information about the deep interior structure, and then we are able to pick it up when it comes back up to the surface under the seismometer,” Banerdt said. The seismic sensors aboard InSight evolved from mission concepts in the 1990s and 2000s that would have dispatched multiple small probes to Mars, creating a global geophysical network. InSight will give scientists just one seismic station, but experts have developed techniques to glean information about the interior of Mars, even with a single seismometer. Researchers have attempted seismic detections on Mars before, but seismometers on NASA’s Viking landers in the 1970s provided inconclusive results. The instruments were mounted the decks of the landers, making them susceptible from interference from spacecraft vibrations and winds. 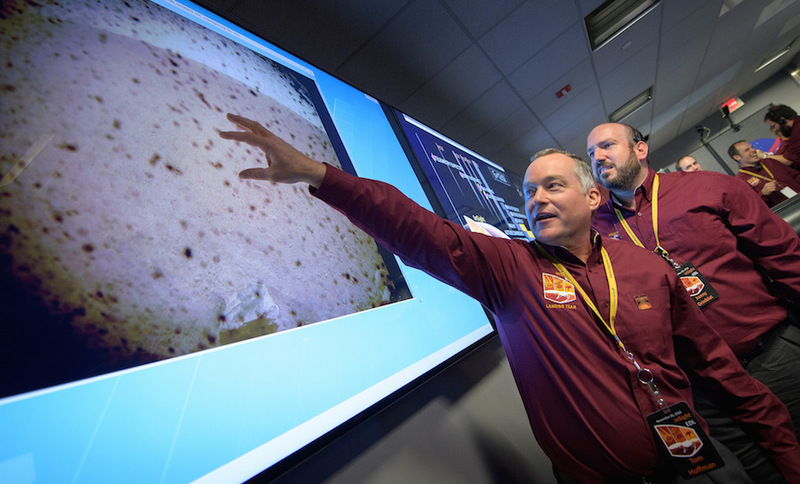 Philippe Lognonné, head of the InSight seismic investigation team at the Institut de Physique du Globe de Paris in France, said scientists do not have a confirmed detection of marsquake, but evidence suggests weak tremors occur on the red planet. Lognonné said, based on existing theoretical models, the seismometer could register around 20 or 30 quakes per year, sensing ripples from all types of seismic waves moving through the planet. Once placed on the surface of Mars, the Heat Flow and Physical Properties Package, know as HP3, will hammer to a depth of 16 feet, or 5 meters, a process expected to take around six weeks with roughly 10,000 individual hammer blows, accounting for several planned pauses to allow the instrument to record thermal conductivity measurements. The metallic mole will probe deeper into the Martian crust than any past lander. “We think this remote probe can actually go down about 15 feet, which gives us a better baseline to measure the temperature increase with depth and be able to estimate the amount of heat coming out of Mars,” Banerdt said. Scientists will also measure Mars’ polar wobble by analyzing radio signals transmitted between InSight and Earth-based antennas. With that information, scientists can determine which way the Martian north pole is pointing as the planet rotates. 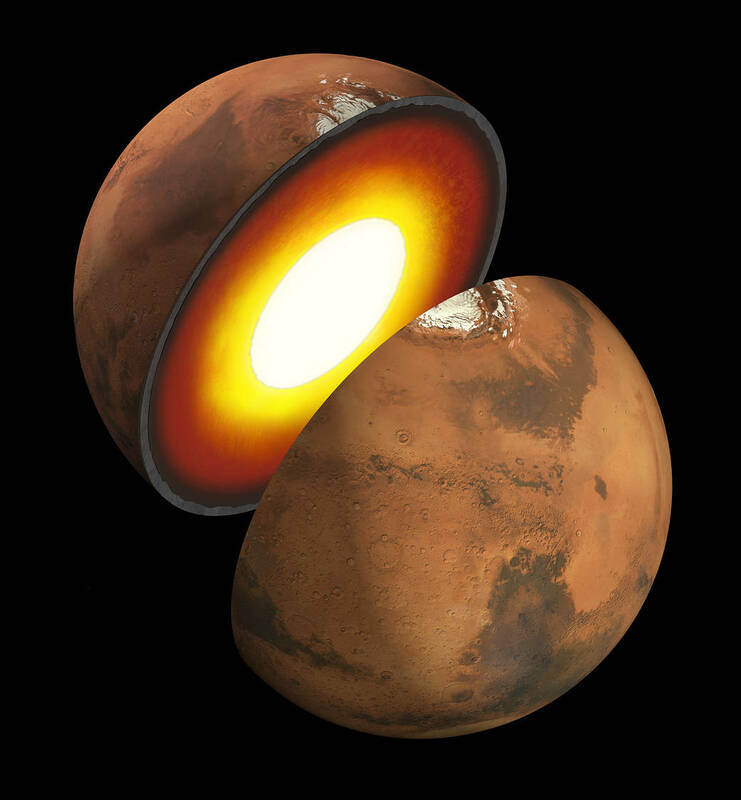 Much of the ancient geologic record on Earth has eroded away, but Mars may still hold clues about how it was born, accreted rock and dust, and formed a hot, high-pressure mantle and core as heavier elements sunk deep beneath its surface. Discoveries made by InSight at Mars could inform scientists how the Earth formed and evolved. 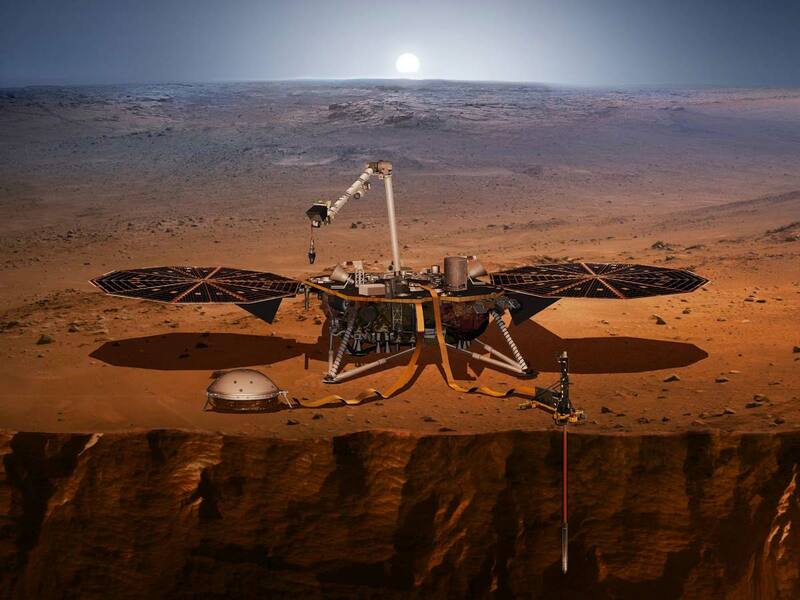 InSight was originally supposed to launch in March 2016, and reach Mars later that year, but problems sealing a vacuum enclosure containing the French seismic sensors forced officials to postpone the mission. Mars launch opportunities come once every 26 months, when the planets are in the proper positions in the solar system, so the next chance to send InSight came this year. Engineers redesigned the vacuum enclosure to eliminate an air leak in a feed-through, or wiring interface, used to route data between the seismic sensors inside the instrument and electronics and communications equipment aboard the InSight spacecraft. The fix passed testing, and officials cleared the probe for launch. NASA’s next Mars mission, the Mars 2020 rover, is scheduled for liftoff from Cape Canaveral atop an Atlas 5 rocket in July 2020, and should reach the red planet Feb. 18, 2021. NASA’s Dawn spacecraft successfully observed Ceres at opposition on April 29, taking images from a position exactly between the Sun and Ceres’ surface. Mission specialists had carefully maneuvered Dawn into a special orbit so that the spacecraft could view Occator Crater, which contains the brightest area of Ceres, from this new perspective. 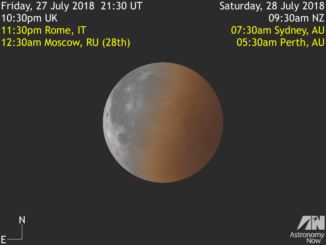 Friday, 27 July sees the second total lunar eclipse of 2018, which also happens to be the longest of the 21st century. Observers in Antarctica, Australasia, Russia, Asia, Africa, Scandanavia, Europe, Central and Eastern South America will see the event. The Moon rises at mid-eclipse as seen from the British Isles, some 6 degrees north of Mars at opposition. 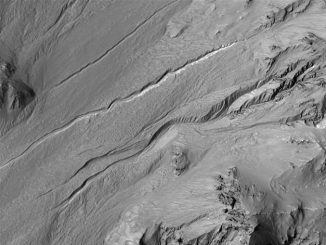 New findings using data from NASA’s Mars Reconnaissance Orbiter show that gullies on modern Mars are likely not being formed by flowing liquid water. This new evidence will allow researchers to further narrow theories about how Martian gullies form, and reveal more details about Mars’ recent geologic processes.